Make Birthday Celebrations Memorable with Boy's Birthday Clothing and 1st Birthday Outfits from Children's Cottage. Your little boy will be picture perfect in charming custom and smocked birthday clothes including those specially designed for 1st birthdays. First birthdays are the most special, so let us create that "special" outfit just for you. Each of our outfits can be personalized with your child's name or initials and of course, number of candles or the actual birthday number. Rich embellishments match any birthday party theme. We also accept personal requests for individual birthday outfit designs to meet your particular party theme, so don't hesitate to ask. We love to design and create! 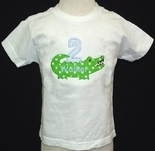 Our birthday apparel is available in sizes and styles to fit 1 to 7 year olds. And, check out our birthday hats section for matching and coordinating personalized birthday hats, baby bibs and other accessories. You simply won't find cuter birthday clothing elsewhere. Boy's Birthday Cupcake John John Outfit. Custom Made Boy's Birthday, 1st Birthday Balloons Outfit. Mickey Mouse Birthday Number, 1st Birthday Shirt Shorts Pants Outfit. Boy's 1st Birthday Cupcake Happy Birthday Monogrammed Shirt.